(Seychelles News Agency) - After a seven-year pause, a new census will soon shed some light on what appears to be Seychelles' healthiest population of black mud terrapin (Pelusios subniger parietalis) found on Fregate Island. The species, which is unique to the western Indian Ocean archipelago, is currently listed as vulnerable on the International Union for the Conservation of Nature’s (IUCN) Red List. This means the species is likely to become endangered unless the circumstances threatening its survival and reproduction improve. During the census, the Fregate team will actively trap, measure and mark all the individuals found on the island, leading to an updated population size estimate of both species of terrapins. 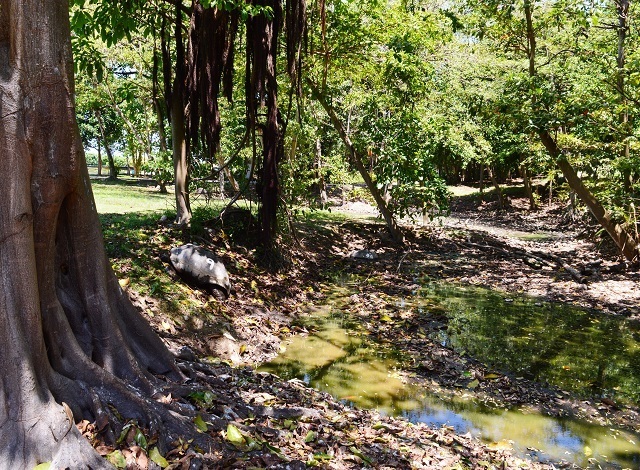 For the past seven years, the black mud terrapin had only been monitored when they were spotted -- most often while foraging for food in the vegetable garden or crossing the narrow road which connects the island’s luxurious villas. According to a research article published in 2008, the black coloured terrapin was introduced to the island located 55 kilometres from the main island, Mahe, in the 1940s to cohabitate with another terrapin species called the Seychelles yellow-bellied mud terrapin (Pelusios castanoides integularis). Both species of terrapins are endemic to Seychelles and are known in Creole as ‘torti soupap’. The conservation manager of Fregate, Janske van de Crommenacker, recalls that the population of black mud terrapins remained in the first decades at slightly more than 10 individuals and a surge in numbers was only possible after the creation of man-made ponds around the island. 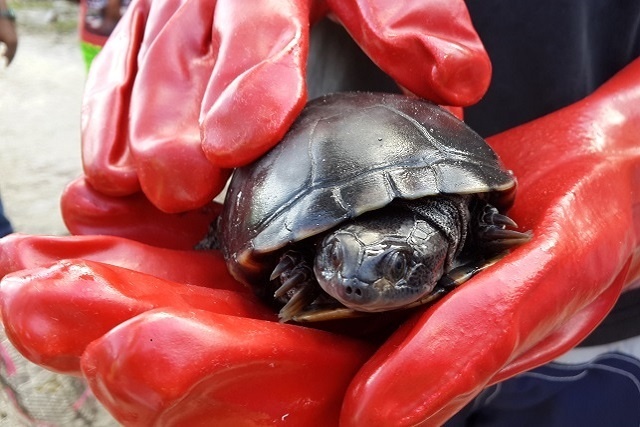 “While the yellow-bellied population remained low to three individuals only, the last census in 2010 indicated that the black mud terrapin have hyped up to 124 individuals,” she said. The terrapins share the 15 ponds with various other species including giant tortoises and moorhens. The ponds or marshes are a constant source of accumulated freshwater which in turn provides food for the terrapins such as plant materials and tiny insects. In the rainy season, when the ponds overflow, the terrapins are more active and are more easily spotted walking the grounds of the island known for its picture-perfect beaches. 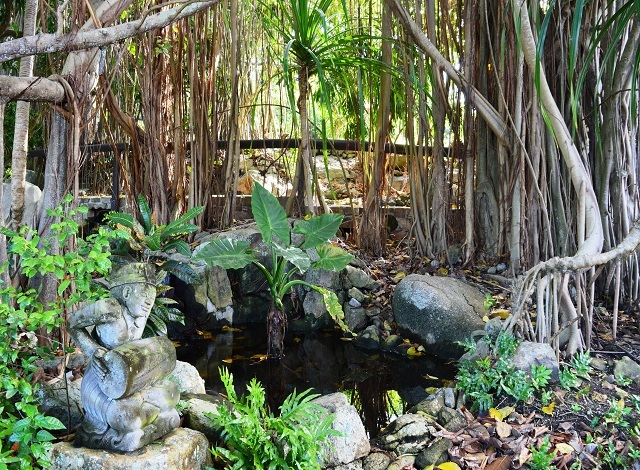 However, during the dry season which in Seychelles runs from May to October, most of these ponds dry out on Fregate. Van de Crommenacker says the terrapins are well adapted to the dry condition of the island and can bury themselves until the arrival of rainfall when the marshes or ponds fill up again. Freshwater turtles were known to exist on a number of granitic islands of Seychelles including Mahe, Cerf, Praslin and Silhouette. These dull-coloured turtles are believed to have been introduced from the African continent or neighbouring Madagascar Island as a source of food for slaves, but in time, due to lack of habitat, predation and possibly pollution, they have slowly disappeared from most of these islands. A significant although unknown numbers of terrapins remain on La Digue, the third-most populated island of Seychelles.